The one-light medium outdoor wall lantern from the District Collection features metal shade that offers an industrial-inspired design. Available in incandescent and LED versions and are dark sky compliant. The versatile vintage form can be used in indoor and outdoor applications. 1-year limited warranty. Please call 1-800-453-2138 for complete details. 6 in. square cylinder with heavy duty aluminum construction and die cast wall bracket. Sleek design offers a superior low-profile option for lighting building exteriors. Powder coated finish. UL listed for wet locations. Callahan draws insiration from farmhouse decor. Hidden within this vintage frame is a modern LED light source that delivers energy-efficient performance. The inner surface of the shade is accented with a contrasting finish to complete the nostalgic look. Additionally, the full reflector provides illumination that is compliant with Dark Sky requirements for full cutoff lighting. A traditional upscale outdoor lantern collection. Devereux features an etched white pillar shade that sits inside a clear seeded glass design. A double scrolled arm finished in Antique Bronze provides elegant scale for a variety of exterior settings. Inner shade disguises lamp source for individuals who wish to use energy efficient sources. Post, hanging and wall lantern options are available. District Collection 1-light Antique Bronze Wall Lantern The one-light medium outdoor wall lantern from the District Collection features metal shade that offers an industrial-inspired design. Available in incandescent and LED versions and are dark sky compliant. The versatile vintage form can be used in indoor and outdoor applications. 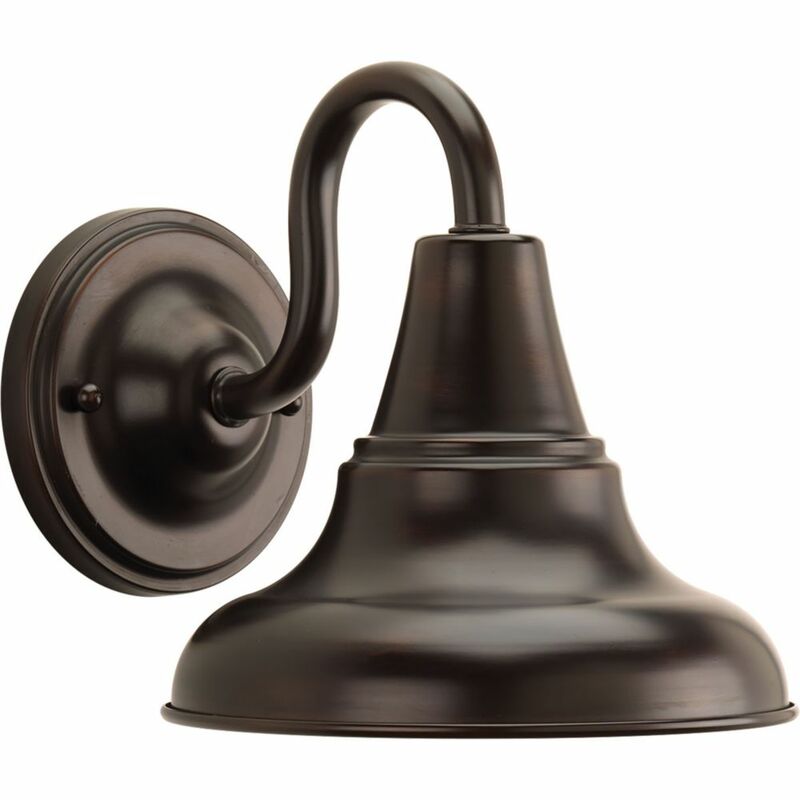 District Collection 1-light Antique Bronze Wall Lantern is rated 5.0 out of 5 by 1. Rated 5 out of 5 by William from I put these lamps in the front porch and on... I put these lamps in the front porch and on garage entry for our mid century house. Added vintage style bulbs. Very happy with results.